"Folks, I just spent two days on the water with an 8 wt. NuCast Smokin' Hot Fly Rod. It's one of the most responsive "Eights" I've ever thrown. Fresh or Salt...doesn't matter. That's my #8 wt on the banks of the Mississippi at right...ready for some bronzeback! 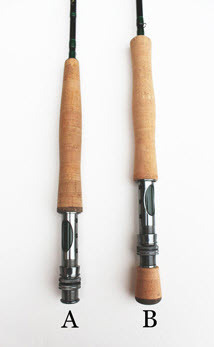 The finish on these rods suggest quality costing well over 3 to 4 times the price. You get these beautiful rods in a custom four piece rod sock that fits into a gorgeous, durable cordura-type green rod tube for protection. 9 feet 4 sections and a new 8 foot 4 wt. for the brushy streams! Each Smokin' Hot fly rod ships in a green protective rod sock and a strong polyurethane rod tube covered with a green olive oxford cloth. NuCast logo is embroidered on each. 404-48 8 ft 4 4 A New! All NuCast graphite fly rods are covered under our Unconditional Fly Rod Guarantee for the original owner of the rod. Simply send the fly rod back to our facility with a $30.00 check and written note explaining the problem. Enclose your name, return address and email address. 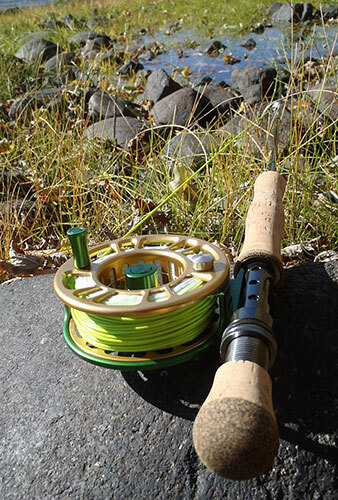 Our technicians will examine the fly rod and determine whether to repair or replace it with an equal value fly rod. Extra tips may be purchased separately. Awesome rod, my Sage sits at home when I go bass fishing . I use the 8wt and it is super!